companions who will never prove untrue to you. can possess no greater treasures. These flowers are wonderful.. as is the Quote Eddie.. I have only been able to grow these types of flowers in pots in doors as they come usually as Christmas gift boxed sets 🙂 Again a wealth of flowers you have.. This particular bulb is potted, but we do have many that are planted. The ground never freezes here so it is perfectly fine to leave them out through the year. This is a great location for these plants and many others. Je suis un Pirate , toujours en quête d’un Trésor …!!! Vous affichez des nombreux trésors délicieux. Pourtant, vous cherchez plus d’informations, je comprends. This blog contains excerpts from the greatest thinkers of the world. My philosophy of life and living has extracted bits and pieces from them and many, many more. I believe being born this or that does not make a person who they are but it is much more than that. ‘Freedom’ is the process by which you are allowed to express your being-ness. Choose it wisely. 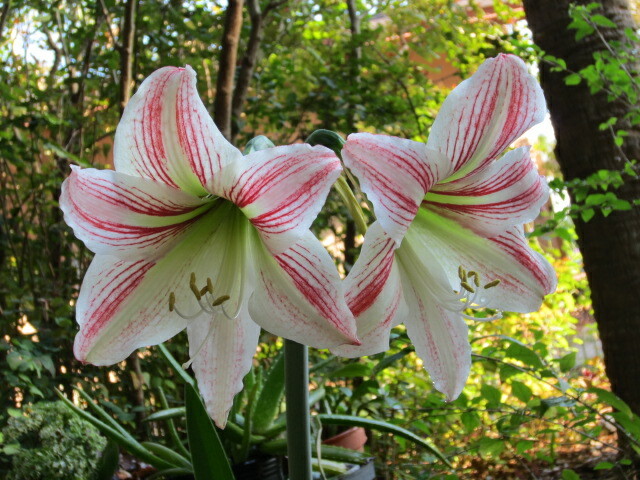 Oh wow, I posted Amaryllis today too. This is beautiful! Spring is here. Many blooms in the garden now. Pleasure, Have a good break, 🙂 Charles. Break? did you say break I can have a break, Charles? alright! I’m gonna quote you on that. Break! yes strange, Meant enjoy the weekend. 🙂 Charles. Your blog is a wonderful place to land. Here, there is peace and wisdom. Thank you for sharing all that you do. Powerful and beautiful words, my friend.